While working on any searching functionality in sharepoint , one of the common requirements these days is to be able to implement a type ahead search which gives the search results to the user instantaneously,as soon as he types anything in the search box, without a postback. 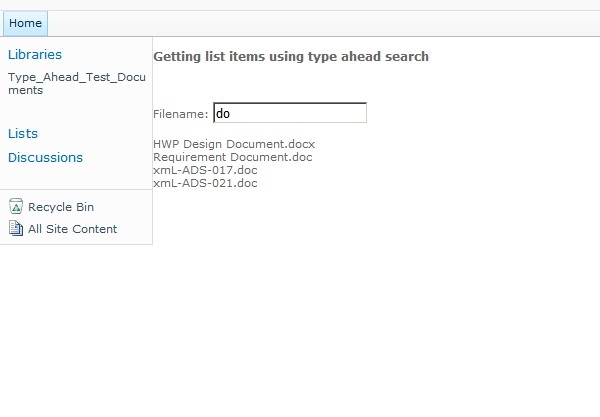 We came across this requirement in one of our projects where we had to search documents in a document library in sharepoint using type ahead search. If you are using an application page (as is the case in this article), we need not include any explicit reference to this file as it is already included in the sharepoint default master page. The HTML consists of a simple textbox to be used as a searchbox and a <span> tag to display the search results. //method that will be called when the text is changed in the search box. Now, I build the solution and deploy this application page and voila !! There's my type ahead search working.! !